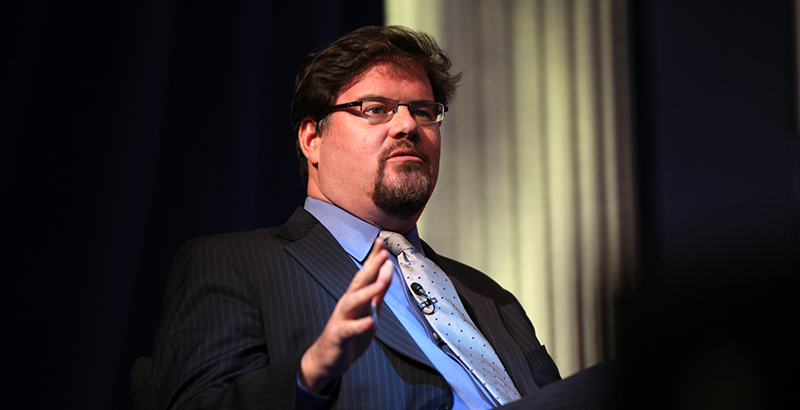 Schools need to be giving kids a stiffer dose of civic education, informed by a sense of patriotism and gratitude for the American way of life — that’s the message conservative author Jonah Goldberg delivered to an education-focused audience at Washington, D.C.’s Hoover Institution on Wednesday. The talk touched on politics and national identity in Trump’s America. A senior editor at the National Review and holder of the Asness Chair of Applied Liberty at the American Enterprise Institute, Goldberg spoke at the invitation of the right-leaning Fordham Institute as part of its Education 20/20 lecture series. Fordham President Michael Petrilli introduced him and later moderated a question-and-answer session. The talk echoed some of the themes of Goldberg’s recent best seller, The Suicide of the West. In the book, he argues that Americans’ love of their national values and institutions has been undermined by a focus in media and academia on historical crimes like slavery. Stripped of its potency, the American myth has given way to a racial populism that led to the rise of President Trump, he writes. In the Hoover Institution speech, he reiterated the assertion. While Goldberg was quick to acknowledge the importance of teaching America’s past mistakes — what he referred to as “Zinnian history,” referring to leftist historian Howard Zinn — he added that they ought to be delivered in a context that foregrounds American values like freedom and equality. As an example, Goldberg cited the foundational promises of the Declaration of Independence, which he called a “time bomb in the story of America.” Though Thomas Jefferson’s invocation of universal equality was incomplete at the time of the nation’s founding, he said, it later formed the basis of the emancipation of slaves and Lincoln’s Gettysburg Address — though he drew some laughs by stumbling on an exact recitation of the speech’s famous opening passage. While he said he was sympathetic to the principle of school choice, Goldberg lamented that greater options were no panacea for the lack of patriotic education. In fact, he said, pricey private schools in the Washington, D.C., suburbs where he lives are among the worst offenders when it comes to emphasizing victimization in America’s past. Disclosure: Kevin Mahnken was an editorial associate at the Thomas B. Fordham Institute from 2014 to 2016.